In this interview, we have the honour of featuring Samantha Skelly from Hungry for Happiness! 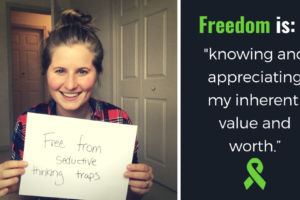 We asked Samantha what 'Freedom' means to her and asked her to share a bit of her story with us. What does Freedom mean to you and what are you “Free from”? Freedom is the visceral feeling of lightness, being able to choose my happiness based on my values and what is most important to me. Freedom to me is being able to speak my truth unapologetically and stand in my truth and power. 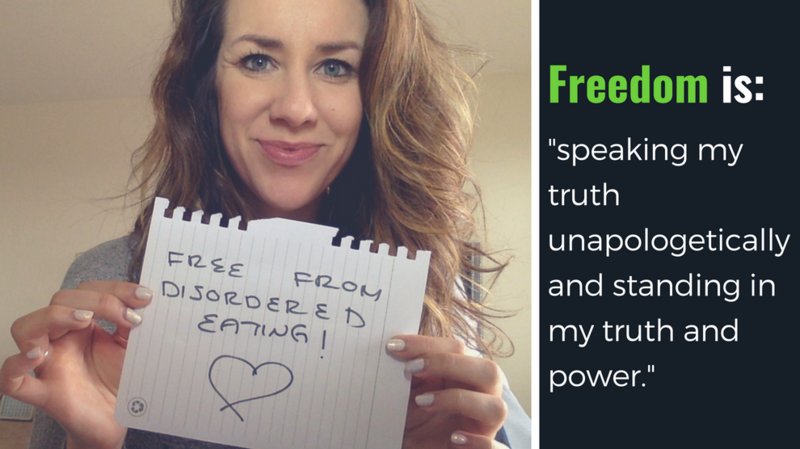 I am free from disordered eating and my battle with food and body. 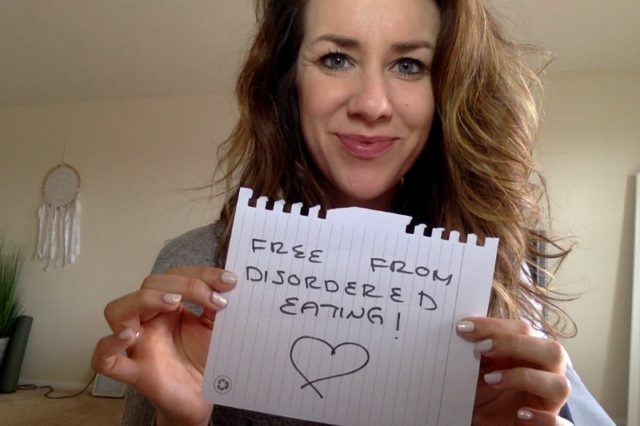 For years I suffered in my ‘diet depression’ – riddled with anxiety when it came to food and my body. I understood what I was truly hungry for and learned how to connect deeply into my body to heal my emotionality. Freedom is being able to speak my truth unapologetically and stand in my truth and power. Tell us a bit of your story. How did you get from where you were to where you are today? Over the course of 5 years–the time I call my “diet depression”–I was on over 50 fad diets and hated my body. It wasn’t until I started to explore the emotional side of my struggle with food and body that I started to see a shift. I spent three years focusing on myself and really digging into self-discovery and healing past emotional wounding and trauma. I also really reconnected with my body and built a trust with it and my intuition. It was through this work that I finally got to a place of accepting and loving my body and feeling at peace with food. I reconnected with my body and built a trust with it and my intuition. Describe the contrast between how your life looked and felt before experiencing this sense of freedom and after? It’s like night and day. I had no idea I could live in this body with the happiness I feel in my heart. I feel a sense of calm and peace in my body. My mind is clear and focused on becoming the highest version of me. It’s truly a beautiful place. I had no idea I could live in this body with the happiness I feel in my heart. How are you committed to sharing this message of Freedom? Though Hungry For Happines — my life’s work and mission. What message do you have for others who may feel trapped or alone right now? You are not alone; you have everything it takes to be able to heal your body. You are a being of light and love, happiness is your natural state. You just need to remove all that is blocking it. It’s not about trying to ‘get there’ it’s about untangling all the conditioning that you’ve inherited. You are not alone; you have everything it takes to be able to heal your body. Samantha Skelly is an entrepreneur, a sought-after international speaker, Amazon Bestselling author, and emotional eating expert. As founder of Hungry for Happiness, a movement to empower women to overcome their disordered eating and body image issues, Samantha has revolutionized the weight loss industry by examining the individual and underlying causes of eating disorders. She has shared her mission on an international platform, with appearances on Global TV, Shaw, NBC, CBC, and BBC, and she’s also been featured in various publications, such as The Huffington Post, The Elephant Journal, and The Prevail Project. Samantha continues to spread her message and transform the lives of thousands of people through her program, worldwide international retreats, motivational speaking engagements, the popular Hungry for Happiness podcast, and her Amazon best-selling book, Hungry for Happiness: One Woman’s Journey From Fighting Food to Finding Freedom, Forever.